If you look at his shot map for Arsenal (bottom of the page), https://understat.com/player/498 you can see that the vast majority of his goals came from shots taken from a central position, typically inside the width of the posts, or marginally outside. He scored tons of goals inside the 6 yard box, and quite a few centrally just inside the area. While he took a lot of shots from wide left, very few resulted in goals. He also scored a few free-kicks from just outside the area, typically inside the D.
For Arsenal he averaged between 3.59 and 4.12 shots per 90 mins over his last 3.5 PL seasons. At United 1.62 last season and 2.28 this season. Key passes per 90 at Arsenal were between 2.17 and 2.49 apart from his last 6 months, when they were 3.04. At United 2.22 last season and 2.73 so far this season. His expected assists per 90 mins this season is surprisingly high at 0.47. Last season for United it was 0.21. At Arsenal it fell between 0.25 and 0.32 during his last 3.5 PL seasons. In the FA Cup games this season he scored from his only shot against Arsenal and had one key pass. Against Reading one shot and one assist, no other key passes. If you compare with Martial. Under Solskjaer Martial averages marginally less than 2 shots per 90 mins. For the whole PL season he is at 1.99 shots per 90 mins. Last season 2.78, the season before 2.43. So in effect, we have bought a player whose physical peak was probably when he was 26-28, then asked him to perform a role that looks similar on paper to his Arsenal role but in reality makes it far more difficult for him to score the type of goals he was used to scoring. I think he's done. Will only continue the downhill trend. I don't know how long we can keep excusing him. I'm yet to see him take 1 game by scruff of the neck and deliver the performance he was supposed to deliver. You get easily wound up don't you? It's just you my man, just you. You're a known Lingard hater, so of course I called you out for finding a way to criticize him over Alexis. Keep the pathetic Lingard hating in his performance thread. We bought Sanchez as a genuine top level game changer, to provide the sort of moments of brilliance we see from Pogba. Instead he now gets credit for being average rather than awful. True. Some of the mental gymnastics to quieten critics is baffling. This. I've been wanting to see us try this for a while now. Rom has been shite through the middle but looks decent when he's coming from the right. He's got pace, likes to run at people and he has a decent cross in him while Sanchez doesn't have the pace to be a winger anymore. Lukaku can play right only in derby matches, when we play on counter atacks. I cant see what he can to offer vs small teams who defends with 10 players. I cannot really think of us buying a player where the expectation and the pleasant anticipation of seeing him play and the actual performances have been farther apart. A player that a few months ago many football fans would have put into their world 11 looks completely useless these days. We urgently need a RW as neither Alexis nor Lingard, Mata or Lukaku are good enough for that position. This is a shame as it seems that with Rashford, Martial and Pogba we otherwise have a great attacking line. Good came, some nice ball interception, created a chance for himself, unlucky not to have scored. OK cameo but his wages are a burden. Thought he looked sharp when he came on, should have scored though. It'd be nice to keep him as a bench option but his wages are too crazy for that. I thought he was fecking awful. How low do you have to set your standards to find something positive to say? I think if we move on from Lukaku he should be our back up striker to Rashford. He looked sharp. Could have gotten a goal and an assist. He was very good today. He looked very sharp and hungry. He certainly isn't a sulker. Wish he scored. It was a real shame he didn't finish that chance. He's looking sharp but a goal or 2 would really help his confidence. Absolutely should have buried that chance a d xaused more problems to a tired poor defence. Maybe he moved himself ahead of Lukaku as best option off the bench. Played decently well. Looks short on confidence. Needs a couple of goals to go in. I think too much is made out of his wages. I don't expect the old Alexis to ever return. Looked decent enough today. Best he's done for a while. Yeah but it's not such a burden, club will survive. Looked good today. Even though the explosive pace is gone, he still has his touch and vision which can be more than adequate quality in a center forward. We must give new deals to our best players who should get high salaries anyway. Not as high as Alexis or course. I get your point though. No idea how He didn't score. He was decent, which is better than he has been for a while. Hopefully it's the start of his improvement (unfortunately that's not the first time I've said that). He is looking better and better. I am boring with that but when we will see him on the right? Strange game today when he came on. Very involved and definitely to wanted to contribute but lacked end product, apart from that nice cross to McTominay. 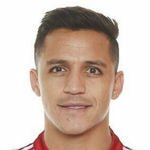 My biggest problem with Sanchez is that he only plays on the left. And he always takes up the positions Pogba likes to take up. As soon as he gets the ball, he always goes south east.